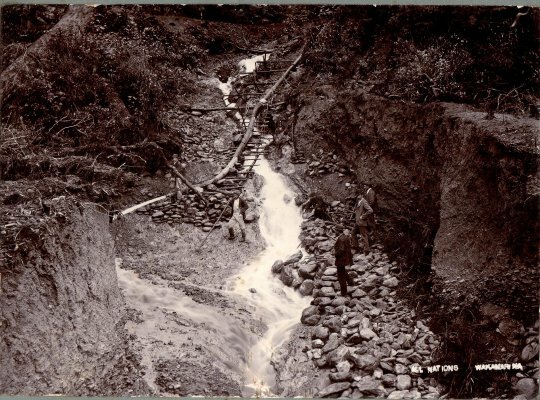 Description A black and white photograph mounted on a green matt showing a stream of water running down a hill with a sluice pipe crossing the stream. Three men stand on the right of the stream. "All Nations Wakamarina" is typed in white on the front bottom right. On the back written in Allen Hale's hand, "Photo taken 1900. John Brown, Edward Nelson; Fred Mayo (Manager), Girdwood." Immediately beneath this in a different hand, "Copied March 1990, Graham Brooks has neg[ative]".